AFTER almost 10 years of singing, dancing and jumping around for young children, one would be forgiven for suspecting life as a member of THE WIGGLES would begin to take its toll. But not so, according to 'red Wiggle' MURRAY COOK, the band's guitarist and one of the three trained early childhood teachers who make up the fun foursome. 'We've been doing it for this long and I'm still enjoying it,' he says. On Saturday, December 16, at Newcastle Entertainment Centre, the Wiggles will stage two performances of their YULE BE WIGGLING Christmas Show at 10am and 1pm. 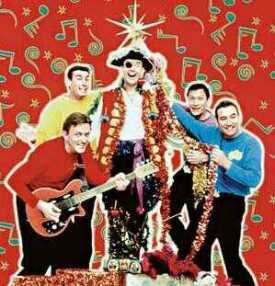 The group has a Christmas CD with new Wiggles songs and their own versions of traditional favourites THE FIRST NOEL, THE LITTLE DRUMMER BOY and ANGELS HAVE HEARD ON HIGH. The Wiggles take on an international perspective on their Christmas album through the songs CHRISTMAS AROUND THE WORLD, A SCOTTISH CHRISTMAS and THE WORLD IS ONE ON CHRISTMAS MORNING. Cook says the group would continue to be successful while children continued to have a positive experience at The Wiggles' shows. 'I suppose it's not about actual values, we just want it to be a positive experience for kids,' he said. 'We tend not to be preachy or anything like that, and we don't have real lofty aims as far as trying to instill certain values. The Wiggles' show still features popular characters from the past 10 years such as WAGS THE DOG, DOROTHY THE DINOSAUR, HENRY THE OCTOPUS, CAPTAIN FEATHERSWORD and THE BIG RED CAR. Cook says the group enjoys writing new material for new generations of children. 'I still enjoy it,' he said. TE has five WIGGLES PACKS to give away. They contain a double pass to the 10am show, a poster and Wiggles clothing and merchandise. To go in the draw mail an envelope, with your name, address and telephone number on the back, to THE WIGGLES GIVEAWAY, PO Box 615, Newcastle, 2300.